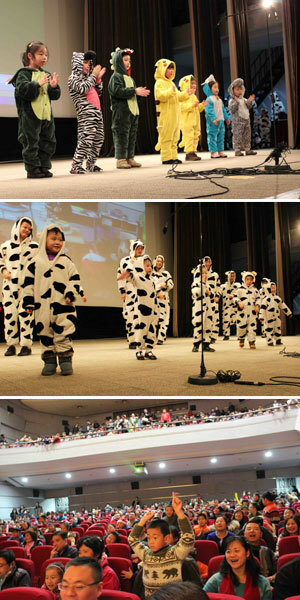 Saturday the 21st of December saw Shane English Schools Shanghai hold their first Christmas show at the Shanghai Library. All of the schools in Shanghai took part. We had everything from Christmas carols to a Korean milk dance. Santa even made several appearances to the delight of the students. Students from Qingpu District school had one of the best performances of the night with a Korean milk dance. Both students and their parents dressed up in big cow costumes for it. Another group from Changning District school entertained the audience with a short voice-over from part of the movie ‘Snow White’. Not only did they do the voices, they also acted out the scene as it was playing on the screen behind them. Yangpu District school had one of the cutest performances of the night with a short fashion show with students dressed first in formal outfits and then in fancy dress. Several students from the Head Office also put on a very entertaining and fun performance of ‘All I want for Christmas is My Two Front Teeth’. In addition to the variety of student performances we also had a clown that did balloon animals for the children, as well as a raffle. There were several prizes in the raffle from scooters and Lego sets to the Grand Prize, an iPad mini. The Grand Prize was won by a student at Changning District school. Also on the way out the children picked up presents from Santa Claus and his Elfs. It was a fun night with the performers doing a great job.